Written by: Jiří VašekIt’s easy to create your own website…you only have to know where to go to find assistance, and where they offer you the best format and deal for your own presentation or promotion. A freehosting server operated by Centrum. After registering, you will receive an address, http://YourName.webpark.cz, as well as www.webpark.cz/YourName. You will have 3 MB of space, access to software programs, and an automatic www template that will help you transfer your pages into HTML codes and upload it. Webpark’s specialty is providing detailed information on visitors to the website, and establishing a password for access. This server supports the placement of a visitor counter, a personal greeting, and the ability to set the date and time. You can administrate it over www interface as well as FTP protocol. This server is literally the grandfather of the Czech freehosting market. Today it offers 15 MB of space for free, and, of course, the tools needed for creating a site with the help of an internet browser. This service is for those who are not too demanding about the functionality and parameters of a presentation. Registration requires filling out a form and agreeing to conditions. Users must include the category of the Mujweb pages catalogue you wish to be placed in, as well as a brief description of your website. You will then receive a very long URL: www.mujweb.cz/category/yourname. One disadvantage of this server is that it is impossible to access it over FTP. 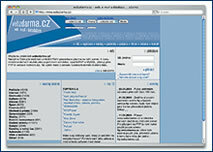 A little known webhosting server, it is the successor of www.crolink.cz. Besides free operation, it offers space up to 100 MB, the possibility of forwarding mail, and data transfer at a speed of up to 1 GB, but all without technical support. In addition, you must register your own domain in the second level! The operator supports various tables and subjects (guest book and visitor counter), and it is possible to create surveys and use the server’s advertising system. Access is possible via FTP protocol or a browser. Another server that has reduced its free space capacity from 20 MB to 1 MB. Typical registration, and the URL format is www.sweb.cz/your_name. Pop up advertisements are rather annoying, but a positive aspect of this service is that an identical e-mail account can be linked to it. The server is very popular, so many domain names have already been taken. You can access your site over FTP and through www interface, and you can increase the size of your website at any time by paying a small fee (10 MB costs only CZK 60 per year). With 100,000 active users in April, this server offers 50 MB of free space supplemented by a 5 MB e-mail box, which you can access through web interface. Webzdarma reserves the right to place an advertising banner on the top of your homepage and on the bottom of each successive page. It is also possible to choose one of 16 different domains in the second order, some of which provide descriptions through the names, for example prodejce.cz (vendor.cz), vyrobce.cz (producer.cz) or aktualne.cz (news.cz). This is a virtual auction house from QXL Poland, which has expanded its field of activities outside its home country. It can take pride in its one million registered users and almost 9,000 transactions each day. Registration is free. General information regarding the educational system. Find on-line English tests, learn who is organizing courses and where you can download TOEFL materials. There is a preparation program for university hopefuls, as well as information on student jobs. This is the quickest and cheapest way to the UK. Booking and purchasing is done exclusively over the internet, and prices depend on availability. You can also travel from Prague to Dortmund, where you can connect to Paris, Budapest or Mallorca. A website outlining all tariffs of our mobile operators, comparing them according to free minutes offered and the number of free SMSs. Very useful, especially because there are currently 43 tariffs and even vendors aren’t always familiar with all of them. – Basically, programs for creating websites. Most beginners use so-called WYSIWYG’s, with which they merely write text, copy all required pictures in this kind of document, and then save it in a file with an html suffix. The editor supplements all tags himself. There are quite a few of these simple software programs – e.g. Dreamweaver, Netscape Composer, FrontPage, etc. Even Word is capable of saving files in an html format, but the quality of the tags is debatable. An alternative is to learn the HTML programming language, like many professionals who create web presentations.